Guacamole. Photos: Shelby Meinkey, Shelbymeinkeyphoto.com. We were to meet at 10. It was 10:15 before I rolled up. I hate being late. I don't mind so much when others are late but me being late is a big deal. It must be something in my head. Something that just can't let the numerical side of time just slip by. It's an equation and when it ticks past a schedule time and I'm not there, I go nuts. There were two things I was determined to do that Sunday. One was to ride a lot of St. George slickrock and the other, at this point, was not to let my being late ruin the whole day. The plan was big and I was a bit worried about there being enough time to squeeze everything in before the sunset at 6. I had done plenty of double headers, but the Mesa Buffet was a new idea concocted over after-hours beers at the shop. The weather was beautiful and a whole day of riding was calling but how to pick where to ride. Due to time constraints and some previous inclement weather, Goose Season had been a bit short and the mesas had not been ridden as often as we had liked. I suggested doing the Double Header, hitting Little Creek and then buzzing over to Gooseberry and riding the Goose. “Fixie” Dave Nice, one to always think bigger, persuaded me that we should add one more mesa to the day and gorge ourselves on the Mesa Buffet. I was convinced. Three mesas in one day. And we were on our way. Heading up SR-59 toward our first delectable, Little Creek Mesa. Little Creek is similar to the Goose mostly only in geographic location. The sandstone is a nice pinkish hue and isn't as abrupt to change as the Goose. It is slickrock but there is a different feel to the ride. A little more flow and a lot less people. Little Creek Mesa is basically located across the street from Gooseberry Mesa. The mesa itself is much bigger and as such has a bigger opportunity for people to get lost. The trail is also only an official route meaning that it is only marked with cairns. There is no official trailhead, no kiosk, no bathrooms, just slickrock extending out before you with some rock stacks to guide you through the maze. We pulled up to the unofficial trailhead and found that there was no one else there. There was still some snow on the ground on the way in so we chose to hit the inner loop that is entirely on slickrock. The outer loop runs through the trees and is more singletrack oriented. It is also not a good idea to ride when wet as you will sink to your axle and ruin the trail. 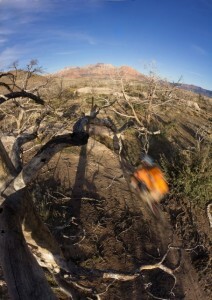 We hit the loop with vengeance, riding quickly knowing there was plenty of trail to be gobbled up during the day. Our solitude was broken only by the two riders we ran into on our way out. I could write about the Goose until my fingers bled and still couldn't communicate what this trail is. For me, it is where I grew up as a mountain biker. It's a maze of rock that is navigated by connecting the dots spray painted on the slickrock. It twists, turns, climbs and drops constantly. But I don't need to tell you about the Goose. I would venture to guess that there is no one in the state of Utah that hasn't ridden it. As part of our Mesa Buffet we hit the Windmill section of the mesa finding our way up to the Bowls and Ledges and then to the North Rim. We wandered to the end of the mesa enjoying the views and wondering if we had brought enough food. Once out to the point, we turned around and followed our knobby tracks back to the car. We did run into a few people on this ride, but that is to be expected. And then we stuffed the Goose with some Guacamole. Finding our way back to SR-59 we headed back into Hurricane and then toward Zion Canyon on SR-9. Just outside of Virgin we turned up Dalton Wash and made our way to the slickrock slabs at the top of the mesa. We piled back out of the car at about 4:30. The sun was low in the sky and the canyon ledges that surrounded us were glowing red. The burnt trees along the trail gave a stark contrast to the lighting that was popping all around us, their black bark appearing as a silhouette against the surroundings. We twisted and turned through the trees following the cairns out toward the edge of the mesa. The best description of Guacamole I've heard belongs to “Fixie” Dave Nice. 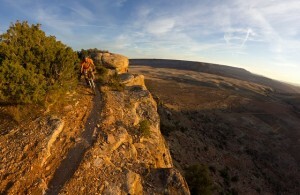 When asked what Guacamole was like, he said, “Diet Goose.” Referring to Gooseberry Mesa and how the trail at the top of Dalton Wash isn't as big, isn't as technical but is similar to the Goose. There are still some ups but they aren't as steep. The rollers aren't as drastic and you can see what is coming at you much better. Guacomole is similar to Little Creek in that it isn't an official trail. The way is marked by rock stacks and there isn't an official trailhead. It is easier to navigate if you keep the giant cliffs around you as landmarks at to the direction you have come from and where you are headed. We did the quick inner loop and made our way back to the car. Our legs were full from the buffet that was laid before them throughout the day. Our bellies were empty from the calories burned. We rolled up to the car on time to have a few recovery drinks and watch the light bounce off the Zion cliffs as the sun sank behind the adjacent mesas. The buffet had been devoured, completely. All are located near St. George. Little Creek Mesa is accessed off of SR-59 a little past the Apple Valley gas station. It is not marked other than by cairns. It is best to go with someone who is familiar with the area as many people have become disoriented. Make sure to have a map, GPS device is a big plus. Gooseberry Mesa is also accessed off of SR-59. There is a big sign indicating where to turn off the highway. The road in is marked, just follow the signs to the trailhead. Once on the trail, connect the dots. Guacamole is accessed off of SR-9. Turn left up Dalton Wash road and climb up the mesa. Follow the cairns. It is best to keep an eye on your surroundings as there are many offshoots and intersections. If you are unfamiliar with any of these trails it is best to go with someone who is. At minimum make sure you have plenty of water and a good trail map.